Insure your preschooler is kindergarten ready and get a jump on learning with Tot Talk's waterproof, durable, USA-made early elementary set of four laminated placemats: 1) ABC Animals (uppercase), 2) Lowercase ABCs, 3) Count Bugs, and 4) Shapes. Learn to recognize and say the letters of the alphabet, numbers and shapes first. Practice pronunciation using phonetics and the pictures used for each letter. Then, learn to write uppercase and lowercase ABCs and numbers correctly. Also, learn about the sides of shapes and how to draw with shapes. For Ages 3 - 7. ✔ DESIGNED BY HARVARD EDUCATED AND SUBJECT EXPERTS - Founded by a mother of 2 and made in the USA, Tot Talk products are developed from scratch with input from kids, parents, teachers, and respective field experts, with the goal of instilling a love of learning early in a child's life. ✔ ACTIVITIES ON FRONT AND BACK SIDES OF PLACEMAT FOR ENHANCED LEARNING - Table Mats are reversible so children can learn from and use both sides of the placemat, compared to other brands which are one-sided. Knowledge is power and Tot Talk's double-sided mats offer twice the learning content. ✔ INSPIRES PARENT-CHILD INTERACTION - Tot Talk's placemat bundles are designed to inspire parent-child interaction and family discussion. Parents can create talking points to share with their children and families can challenge or test each other at meal time. 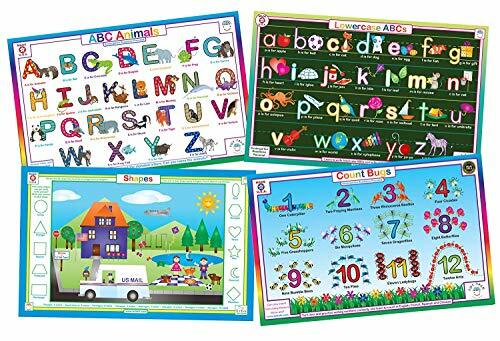 ✔ EDUCATIONAL DETAILS - Be Kindergarten-ready with Tot Talk's reversible, set of four, laminated, early elementary placemats: 1) Uppercase ABC Animals, 2) Lowercase ABCs, 3) Count Bugs, and 4) Shapes. Learn uppercase and lowercase letters, numbers and shapes. If you have any questions about this product by Tot Talk, contact us by completing and submitting the form below. If you are looking for a specif part number, please include it with your message.